Situated in lower Salento, in the province of Lecce, Melpignano is part of those localities belonging to Greek Salentina, associated with the Griko dialect derived from Magno-Greek (10th-4th Centuries BC). The presence of man on the territory dates back to Neolithic times and the Bronze Age, brought to light by the Menhir, megalithic constructions. The origins of Melpignano, instead, is discussed as dating back to before the old pre-Roman, referring to the Greek populations where the local dialect was derived, or to the presence of the Roman centurion named Malpinio, who was awarded this land for valour demonstrated during the league of the Greek-Messapian wars, led by Pirro (280-275 BC). During the High Medieval period, Melpignano was an important Byzantine centre, so much so that it maintained the celebration of the liturgy in Greek, even under the advent of the Normans (11th Century). King Tancredi of Altavilla gave the feudatory to Giambattista Lettere in 1190. After the arrival of the Angioini in the south, the feudatory passed to the Del Balzo Orsini Family in 1300, the Tarantino Family, the Musco Family, the Ramirez of Glanos Family, the Castriota Family, the Acquaviva of Aragona Family and finally the de Luca Family in 1757, who kept it until the abolition of feudatory rights in 1806, by the wishes of Giuseppe Bonaparte, governor of the Republic of Naples. In 1861, Melpignano entered into the Reign of Italy after a plebiscitary vote the previous year. A visit to Melpignano can begin with the ex Augustinian Convent (1573-1662) and the adjacent Carmine Castle (1656), a superb example of Baroque from Puglia. One can then enter the habitation through the beautiful porticos of Piazza S. Giorgio, where the homonymous church is situated with its beautiful polychromed glass windows. Among the civil buildings we would like to mention: Palazzetto of Notar Zullino and Palazzo Maggio, the Baronial Castle and finally, to round off the visit, an interesting hypogean oil-mill from the 17th Century. Every year in the square where the ex Augustinian Convent is situated (second half of August), the City holds a conclusive concert of the manifestation known as the “Night of the Taranta,” when some Salento cities come to life with the pinching rhythms. 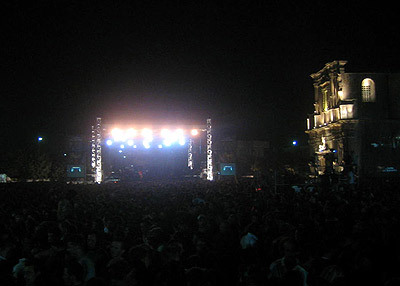 The square is so large, that the manifestation has grown in the number of participants, having now reached more than 100,000 public spectators.